Threats to bomb one of Springfield’s most visible mansions illuminated the murky connections between city fathers and the local underworld in 1931. Machine-gun toting police officers took up guard posts at 1303 Wiggins Ave. in May 1931, in the midst of rumors that the home’s owner, Dr. Charles Compton, had been threatened by gambling interests. Compton (1876-1959), a surgeon, also was a founder and leader of the Wentworth Club, an insurgent group of local Republicans. 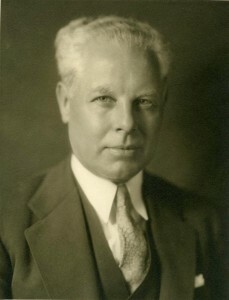 In the 1931 mayoral campaign, when the regular Republican organization supported incumbent Mayor Hal Smith, Compton and the Wentworths backed John “Buddy” Kapp, who won and took office in April. The precaution has been taken in consequence of rumors to the effect that underworld characters have threatened to make reprisals on Doctor Compton because of Mayor Kapp’s recent order against gambling. The doctor was one of Mayor Kapp’s most earnest supporters in the mayoralty campaign. Police remained on duty at Compton’s home for several days, but no attack was attempted, and no one was ever accused of making the threats. With no further developments, the story dropped off newspaper pages within a week after it broke. It remains unclear whether the threats were serious and what the motive was. However, considering some of the characters involved in the complicated dispute, Kapp and the police probably were smart not to take the threats lightly. As far as can be determined from newspaper coverage, Kapp (who ultimately won four terms as mayor) never mentioned gambling as an issue during his 1931 campaign for mayor. Throughout his 16 years in office, in fact, he was never considered a gambling opponent. On May 13, the Journal published a front-page story about a mysterious visitor who had raised alarm in the Oak Knolls subdivision, where Compton lived. “A well dressed, affable stranger who asked for odd jobs in order to get something to eat and then made his getaway in a high powered sedan has residents of Oak Knolls mystified,” the story said. The man next went to a home just south of Compton’s and asked for directions to the streetcar line. However, he went instead behind the neighbor’s home, and nearby residents called police. The man then returned to the Compton home. The mystery visitor apparently is what prompted the police guard, according to the Journal’s May 17 story. Though the doctor was not disposed to attach importance to the peculiar visit of the man who left in the Missouri car (editor’s note: it’s not clear how the “Missouri” identification was made, since the incident took place late at night), the police were impressed with it, particularly when they heard that the visit had been followed with underworld gossip of designs on the physician and reports of implied threats and telephone warnings made to others. In one instance a mysterious telephone call was received by a neighbor ordering him to tell Doctor Compton “he had better make good his promise or we’ll blow up his house.” When the neighbor asked who was calling, the reply was “that’s my message,” accompanied by quick hanging up of the telephone receiver. Ever since the mayor issued his order against gambling, the underworld has been agog with speculation and bizarre stories concerning the status of the so-called “sporting element.” The gossip has included tales of campaign contributions and deals. Then, too, there have been stories of a fight among the gamblers for control of various privileges which they expected to enjoy. The late Benjamin DeBoice, a probate judge who was active in Republican politics, briefly discussed the threats against Compton in local history interviews conducted in 1978 and 1979 by Charles Ruge and Cullom Davis. DeBoice tied the threats to a Metro East gambler named Harry Murdock (misspelled “Murdoch” in the interview transcript, which also misspells Kapp’s last name and misidentifies the police agency involved). Murdock was best known as the owner of the Mounds Country Club and Garden, a casino located on what now is the site of Cahokia Mounds State Historic Site. It’s also possible, of course, that the threats were made by Springfield-based gambling interests who wanted to make sure Kapp kept Murdock and his allies out of Springfield. Certainly, if Murdock’s organization was behind the Compton bomb threat, it turned out to be a paper tiger. On July 7, city police closed down the C&A Smoke Shop, 315 E. Washington St., operated by reputed Murdock associate Lon Morris, only four hours after it opened. Morris … makes his headquarters at the Hotel Abraham Lincoln, where he has been living for the last year. In association with Murdock, he fitted up the C&A Smoke Shop last May. It failed to open in consequence of Mayor Kapp’s declaration that there was to be no more gambling in Springfield. A few days after the raid, Morris meekly agreed to abandon the C&A and remove all the gambling devices in the shop. In return, charges were dropped, and Morris left Springfield. But Morris’ contention that other bookmakers were operating, apparently with no interference from city police, seems to have been accurate. Only four days after the C&A Smoke Shop was shut down, Sangamon County sheriff’s deputies raided two bookmaking parlors in the 100 block of North Fourth Street, while city officers – including Police Chief C.F. Nuess – stood by and watched. “I don’t think there is any betting going on inside,” Nuess told deputies before they raided one parlor, operated by notorious gambler Charles Dawson. The deputies found about 50 people inside the parlor and seized copies of the Racing Form and several yards of ticker tape with race results on it. “Within a week the machines appeared in billiard halls, restaurants, confectioneries and cigar stores,” Journal reporter Robert Rennick wrote Dec. 16. However, the killings near Glenarm in December of two St. Louis-area mobsters, Tom Saranita and Sam Albrizzi, were linked to a “slot-machine war” between Springfield and St. Louis gangs, and that put new pressure on city fathers to clamp down on gambling. On Dec. 15, Kapp and Nuess once again banned all public gambling. Mysteriously, Rennick reported, Fleischli and company pulled all their machines behind closed doors 15 hours before the city announcement. Fleischli denied he had gotten advance orders to remove the machines. “A lot of fellows have been putting slugs in my machines and in many cases have stolen them. When this happens, naturally my men get pretty sore and I don’t want any trouble,” Fleischli told Rennick. Rennick concluded his story by saying local gamblers remained undaunted. But everything didn’t turn out all right for Charles Dawson, one of those arrested in Metcalf’s July raids. The final act in Springfield’s 1931 gambling conflict may have taken place the evening of Dec. 28, 1931, when Dawson was shot to death gangland-style at Seventh and Washington Streets. Police had a lot of theories, the Journal said, but no suspects. Dawson was one of the local gamblers instrumental in driving outside gambling interests from Springfield last summer. … Police are of the opinion that his death is either a direct or indirect result of this activity. They also advanced the theory that he was killed by outside gunmen at the behest of local residents connected with liquor and vice in the city and county. For the last three months Dawson had steadfastly refused to “go along” with a local syndicate that was slowly gaining control of liquor and gambling and this may have been the cause of his death, authorities last night indicated. Dawson (1882-1931) was buried in a classic mob ceremony involving four flower cars, a several-block-long funeral procession and an interesting group of pallbearers – among them a police magistrate, a former state’s attorney and a former police chief. No one was ever charged with killing Dawson, but police said they recovered the murder weapon in 1932, after a wild series of shootouts in Christian County in which three people, two of them members of a Springfield-based extortion/murder gang, were killed. Officials speculated that Scire and his cohorts, Pete LaRocca and Vincenzo Mantella, also had killed Saranita and Albrizzi, the St. Louis gangsters whose bodies were found near Glenarm in December 1931. Dr. Charles Compton was more than a leader of the Wentworth Club; he essentially was its inspiration – as proven by the fact that the club adopted his middle name, Wentworth, for its title. The club started as a recreational group, holding picnics, turkey shoots and similar events on its own grounds near the Sangamon River southeast of Springfield. Membership reached a height of about 3,000 people, but politics gradually began to dominate the organization. Eliminating the controversial subject of politics in connection with the Wentworth club, there are a lot of people who will always have happy recollections of the associations formed through the Wentworth club and the kindly things it did. 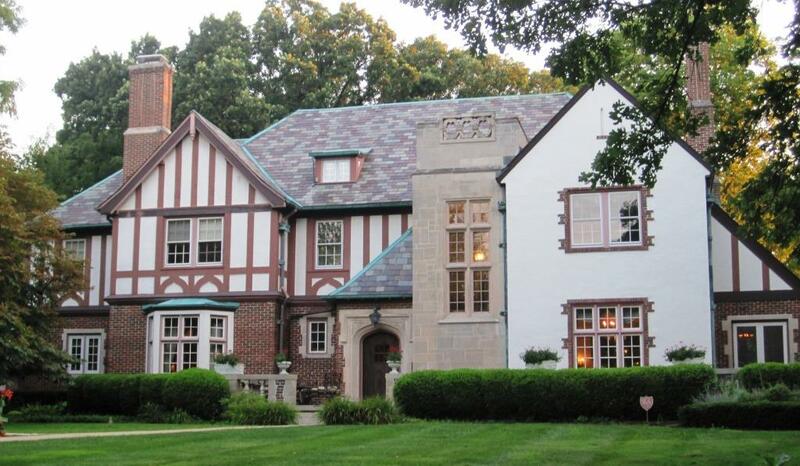 Dr. Charles Compton’s Tudor-style home, designed in the 1920s by the Helmle & Helmle architectural firm, sits on an acre of ground at Wiggins and South Grand avenues, across the street from Washington Park. Compton was listed as the resident when the home first appeared in city directories in 1927. The 5,500-square-foot home was for sale – list price $749,900 – as of August 2016. 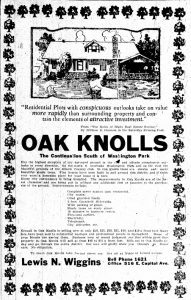 Like the home at 1303 Wiggins, many of the houses in Oak Knolls were designed by Helmle & Helmle, one of Springfield’s best-known architectural firms in the early 1900s. 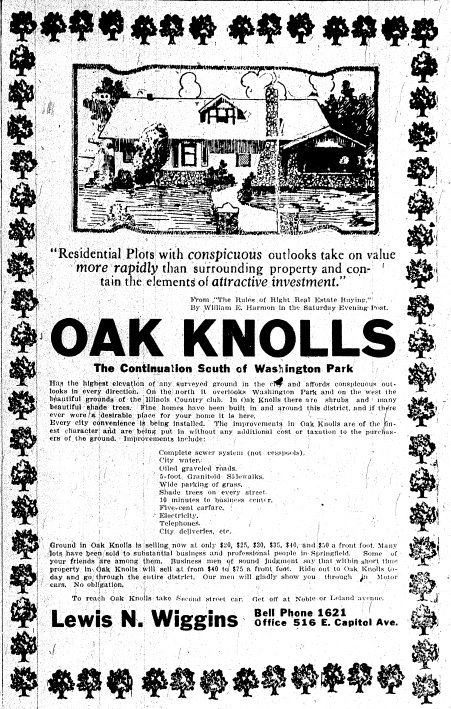 A 1911 newspaper advertisement for lots in Oak Knolls boasted that the properties all had sewer connections (“not cesspools”), “shade trees on every street,” and five-cent carfare. The Mounds Country Club and Garden, owned by Harry Murdock (1883-1945) and several other Metro East gangsters, operated from the 1920s until the 1950s. The lavish nightspot could hold 2,500 people for dancing and featured floor shows with such stars as Rudy Vallee and Sophie Tucker. Murdock was convicted in Springfield federal court in January 1932 of income tax evasion and sentenced to a year in city prison. However, an appellate court overturned the conviction that December. Joseph Fleischli (1884-1959) was a sales manager, an expert on St. Bernard dogs and, for a while, a kennel club owner. He was supported by the regular Republican organization in his 1931 bid for the Springfield City Council. However, Fleischli finished 11th among 24 candidates in the February primary election; only eight were nominated. This entry was posted in Crime and vice, Law enforcement, Local government, Politics, Prominent figures. Bookmark the permalink.